No disease that can be treated by diet should be treated with any other means! Forty percent (40%) of all health care costs today is related to being overweight and obesity. 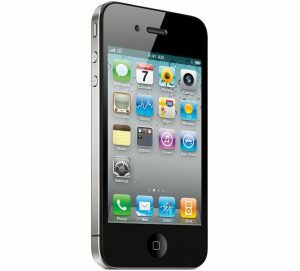 This means that 40% of your health is under your direct control. Eighty percent (80%) of your fitness is tied directly to your diet, while the remaining twenty percent (20%) is tied to your fitness and exercise routine. Saving money the SR925 MET Diet Program will allow you to spend money on other needs like clothes, because after you start losing inches you will need new clothes with a smaller waist line. I went from plants with a 37-inch waist line down to 30-inch waist line. After four (4) years, I have a 29-inch waist line. I also have a lower blood pressure reading and blood sugar index reading. My blood pressure usually is 116/61. 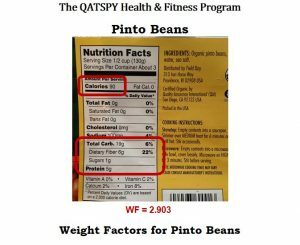 In my article The SR925 Diet Program WF Compound Effect, I described how the lower the Weight Factor value is, the larger the Serving Size on the Nutrition Label. And conversely, the higher the Weight Factor, the smaller the Serving Size. That is just one advantage that the SR925 or 925 MET (Metabolic) Diet Program Weight Factor provides. The other is looking at hidden sugars in the form of starches that are in our foods. Take, for example, my favorite comparison of the Idaho potato to that of a Sweet Potato. 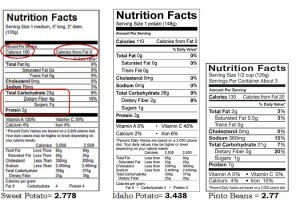 If you just went by the sugar content for these two potatoes, you would conclude that the Idaho potato had less sugar, 1 gram, compared to the Sweet Potato, 7.0 grams. Refer to the Nutrition Label for these two potatoes. The book Sugar Busters; Cut Sugar Trim Fat by H. Leighton Steward; Morris C. Bethea, M.D. ; Sam S. Andrews, M.D. ; and Luis A. Balart, M.D. all compared the Sweet Potato and Idaho Potato also. They determined why the Sweet Potato, the perfect food, was a healthier choice than the Idaho Potato. One reason was the starch that is processed by the body, as it converts to sugar and is stored as fat. Once I started eating my meals between 9 AM and 5 PM based on Metabolic Circadian Rhythms, I realized some weight loss results, but not what I was looking for. I needed another component to boost my weight loss by turning my body into a calorie-burning juggernaut. I need to determine what made the Sweet Potato a healthier choice, based on data from the Nutrition Label that everyone has access to. That way everyone would have the means to lose weight the same way I did. I knew if I could use information from the Nutrition Label, then I could start making better choices on other foods in order to lose the weight that I needed to. Based on my body-type, I needed to lose about 40 pounds. It is nice to have charts to select foods that you can eat and still lose the weight, but one needs the means to analyze their own food, based on their taste. I started analyzing foods at the two ends of the spectrum to develop a formula that I could use to make healthier food choices, even at restaurants. I compared the Sweet potato with potato chips, which are considered the worst food. I also matched up the Sweet Potato with the Idaho Potato to crunch the numbers, using various categories on the Nutrition Label. 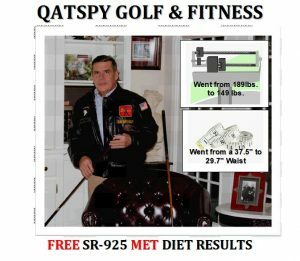 After two weeks of research, I figured out the effective formula that became the Weight Factor (WF) in the SR925 MET Diet Program. 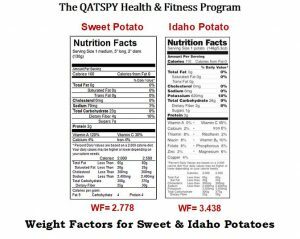 Look at the two Weight Factors for the Sweet Potato 2.778, and the Idaho Potato 3.438 in the Nutrition Label posted above. Now there is one other food that is considered the perfect food besides the Sweet Potato and that is the Pinto Bean at a WF of 2.903. 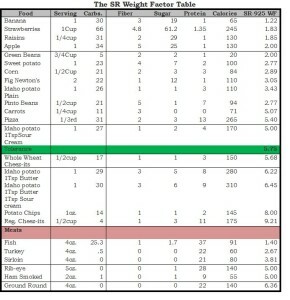 Eighty percent (80%) of my meals are from foods with a WF at or below 3.25. Ten percent of my meals are from foods with a WF between 3.26 and 5.75. The other 10 percent of my meals are from food items that don’t exceed 7.5. As the results of my SR925 MET Diet Program based on the Weight Factor (WF) that I started in December 2014, I’ve lost 6- inches within 3 months and an additional 2-inches by 9 months. The 8- inches that I lost translates into 43 pounds, three more pounds than my goal. At the present time, I have maintained this weight loss of 43 pounds. The true measure of a successful weight loss program isn’t the weight you lose, but the weight loss that you can maintain and still remain healthy. I don’t take any meds, and my blood pressure is 110/65, and my sugar level is 95 after eating. The SR925CR Diet Program is effective. The SR925CR Diet Program is convenient. The SR925CR Diet Program is FREE. The SR925CR Diet Program allowed me to drop 6-inches in my waistline in 3-months and 2 additional inches, in 6-months that translates into 43 pounds. The additional benefits SR925 MET Diet Program NO FOOD to order, enjoy home cook meals and restaurant food with friends, spend your money on something else like clothes that will fit because of the weight and inches that you lost and because the SR925 MET Diet Program is FREE, NO COST TO YOU to use. Now 80 percent weight of loss is based on your diet; the other 20 percent is based on a fitness program. You don’t have to have a rigorous or an intense fitness program to be effective. I have a home gym with no free weights over 35 pounds. A lot of my workout elements include a medicine ball. To make a full impact in your fitness program, you will need to add a sport that provides a social component. I would highly recommend the sport of golf. It can be played from age eight to 98, on a team or an individual level. This is why golf makes a great homeschool athletic activity. 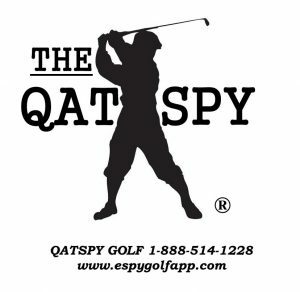 My book, The ESPY Golf Swing Coach, is perfect for those looking to pick up golf and need to learn the fundamentals and techniques in golf, or for those golfers who would like to improve their handicap. To help develop a more effective golf training exercise in your backyard or vacant field, I would recommend purchasing a dozen or more of the Almost Golf Balls® from LIBERTY Health Supply. Please select one of the products below to purchase these golf balls that simulate the actual golf ball without the concern for property damage or personal injury to others. These balls only travel a third of the distance of an actual golf ball. If you use the Promo Code: ALMOSTGOLF you will receive free shipment on any order of Almost Golf Balls® from LIBERTY Health Supply. I have a utility bag full of these Almost Golf Balls that I practice with three to four hours per day, four days per week. 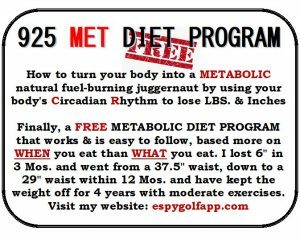 I have also included a FREE 925CR Diet program that anyone can access, where I lost over 40 pounds and 7.5-inches in my waist within nine-months. I went from 37.5 inches in November of 2014 down to 30.0 inches in July of 2015 with the effective 925CR Diet Program that I developed, see detailed below. 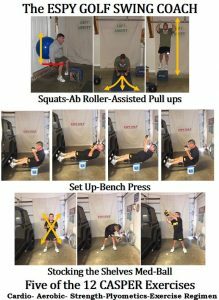 A part of the CASPER Fitness Program are golf exercises with medicine ball – that includes Stocking the Selves and medicine ball exercises Burpees. For endurance and a full body workout, I also include a boxing glove-punching bag exercise. 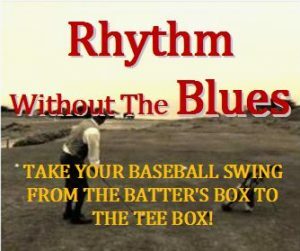 Also, learning The ESPY Golf Swing Coach process is an excellent way to develop natural Rhythm without experiencing the Blues in your golf game to build confidence; learn how to take your baseball-style swing from the batter’s box to the tee box. 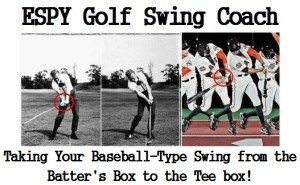 Here’s the QUESTION: How many times standing in the batter’s box did you think about your golf swing mechanics, techniques, or elements. Your were only focused on the pitch. Why don’t use the same Outlier technique in golf.